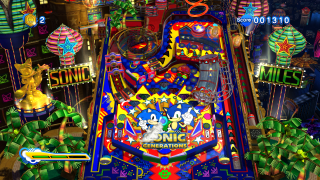 Casino Night, sometimes referred to as Casino Nights, is a DLC stage for the console version of Sonic Generations, and is an adaptation of the Casino Night Zone from Sonic the Hedgehog 2. This stage was given out as a pre-order bonus for pre-ordering the console versions of Generations at GameStop, and is less of a stage and more of a Pinball minigame, unlike the handheld version, which features this zone as a full stage in place of Chemical Plant on the console systems. It is available as DLC for those who downloaded the Steam version on December 26, 2011, originally for USD $1.59, GBP £0.99, EUR €1.59 or AUD $2.99. As of September 29, 2016, this stage is now available for free to all Steam owners, and as of April 2018, it is also now a free download on Xbox Live after Sonic Generations was added to the Xbox One backwards compatibility list. Simply put, the player aims to get the highest score they can by using either one of the Sonics as the ball. By shooting Sonic up ramps and into targets, they will reach a slot machine where the Jackpot Medals collected in the table can be used to play. Matching three symbols on the slots will make it rain rings on the pinball table and further increase the player's score. The more Jackpot Medals collected, the easier it is to get a Jackpot on the slots. The pinball table is operated by using the / button to launch Sonic, then using the shoulder buttons/triggers to control the flippers. The table can be tilted using the Left Stick, but the player must be careful not to do it too much, as excessive tilting will lock up the controls until Sonic rolls off the bottom of the table. The player can also use a special ability with the / button that varies depending on which Sonic they are using; Modern Sonic gets his usual Boost which can be used until the Boost Gauge runs out, whereas Classic Sonic is given 3 Spin Dashes to change direction with. When Sonic rolls off the bottom of the table three times, the stage ends. This page was last edited on 1 May 2018, at 10:49.